Sweet Ritual opened on December 15th and is located inside the Daily Juice Cafe, in the Hyde Park neighborhood of Austin. Their soft serve vegan, gluten-free ice cream is based on soy and coconut milk, and they also have gluten-free cake cones! 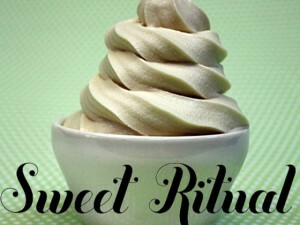 Sweet Ritual is open 8:00am to 8:00pm Monday-Friday and 9:00am to 8:00pm on Saturdays and Sundays. We can’t wait to stop in the next time we are in Austin!